The phenomenal duality of light and matter – and the wave and particle character they both appear to have – is the focal point of this exhibition of paintings and wall-drawings by Daniel Lergon. The works trace an energetic memory sedimented in the gallery walls during cold fire, an exhibition that took place here in 2008. The metal wall drawings emphasize the materiality of the space they form a part of and ‘matter’ itself as a concept. The white paintings could be considered to stand in opposition to these weighty figures. They emit volumes of light that we have to physically move in from side to side in order to see, closer to and further from the canvas, in rhythmic accordance with our optical experience and the pace of our eyes moving over the canvas. 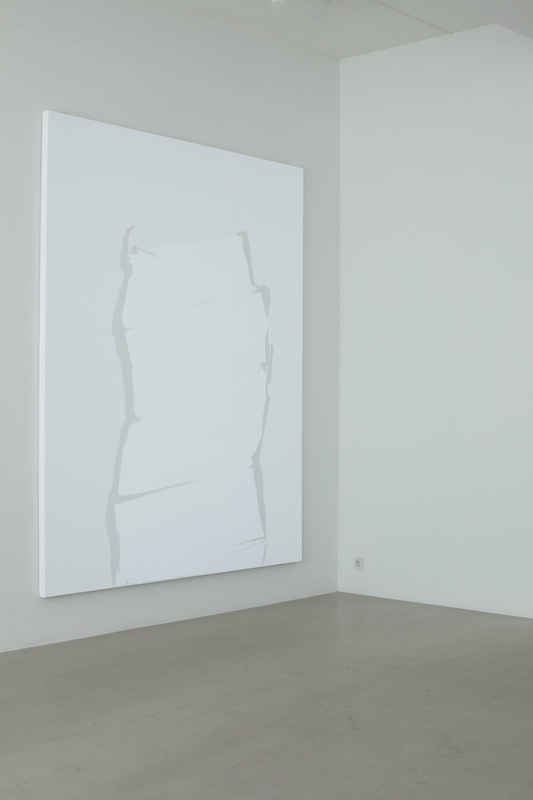 Daniel Lergon’s white paintings consist of transparent lacquer on a retro-reflective fabric. This contrasts the traditional idea of painting as the application of pigments to a surface and instead lets the surface itself produce the colour, modulated by a transparent medium. 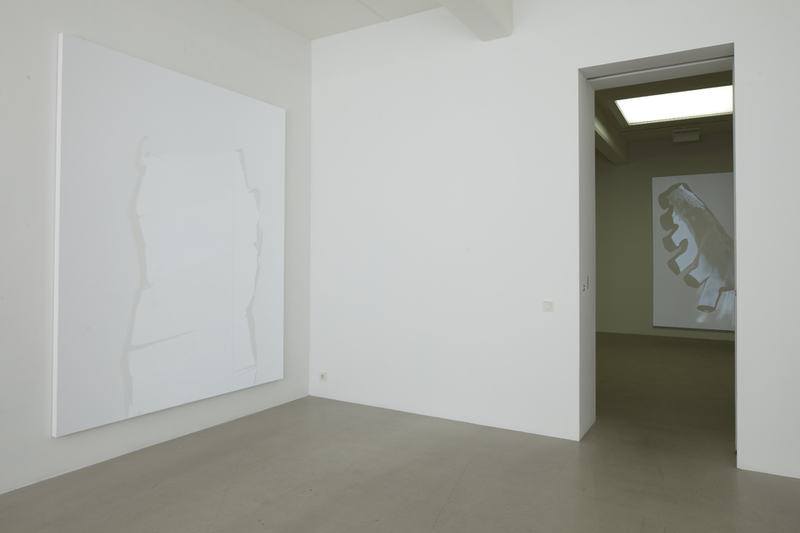 The white paintings create a scattering of light in all directions, a thickness in the atmosphere of the immediate surroundings of the painting. The whiteness is dense and pillowy, flattening and bulging, appearing and disappearing with the movement of the beholder. What are otherwise subtle, ephemeral figures are brought into focus by the near vacuous surfaces that surround them. Whiteness factors crucially in our existence: in the strong rays of daylight, in the essential first nourishing drops of milk, in the white flag offering peace, in socially constructed racial identities, in a sheet of white paper that carries an artist’s deliberations, in the sterile environments of a hospital or laboratory, but also in materials valued for their aesthetical assets such as pearl or marble as well as in the ‘purity’ and concomitant high status of the white gallery space, the white cube. And yet, white is considered a non-colour. Even though we know that white light is the sum of all colours in the spectrum, a white plain or surface is considered neutral and deemed unfinished or naked. Daniel Lergon, born 1978 in Bonn, lives in Berlin.